​Safety comes first - Always keep eyes out for cars coming your way. 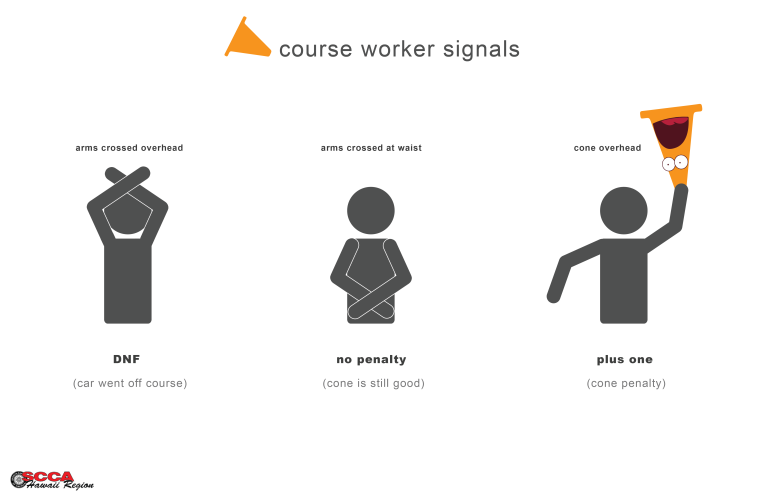 Keep an eye on other workers at your station, you might see something that they can't.​ Be aware of spectators, and make sure they do not wander into an active course. Cars on course can do unexpected things. A lost driver can veer into oncoming traffic, or surprise corner workers. Stop cars that are lost or point them to a safe course exit. Only get cones once you feel it is safe to do so. Remember to be aware of your surroundings! Always stand up. You never know when you need to pick up a cone, or get out of the way of a car. When you see a cone hit at your corner, RUN for it! You have approximately 30 seconds to get to the cone(s), put them back in the box, and get back to a safe distance. If you can’t get to the cone, or there are a bunch of them, DO NOT try to be a hero! Have the radio worker call in and the starter can hold the next car. If a second car is on track then they can get a rerun if the cones are down. Always face the course. Know where the cars come through your area. If you are holding the red flag, always keep it at the ready in your hand. Don’t roll it up. Keep it bunched up in your hand. If you are hear "Red Flag" on the radio, or see something that requires cars on course to stop (stalled car, spectators/non competitor cars crossing the course, wildlife etc.) wave the flag around vigorously. Remember, the driver is very focused on the course and you need to make the flag stand out for them. As the flagger/radio/corner captain, keep an eye on your runners. Make sure they stay safe and are aware of incoming cars. When the car stops, quickly get over to the driver and have him continue through slowly or give other directions that the safety steward radios to you. Remember, there may be another car still coming behind and it may not be slowed or stopped yet! 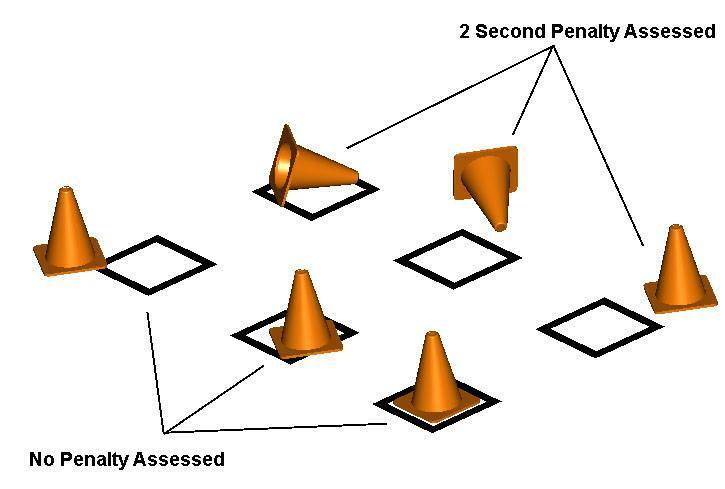 Auto-x uses the idea of "Down OR Out" for cone penalties. If the cone is knocked over, it's a penalty. If the cone is out of the box, its a penalty. If the cone is upright, with ANY portion of the base in or touching the box, then it's not a penalty. ​"Pointer" or lay-down cones do not count towards penalties. 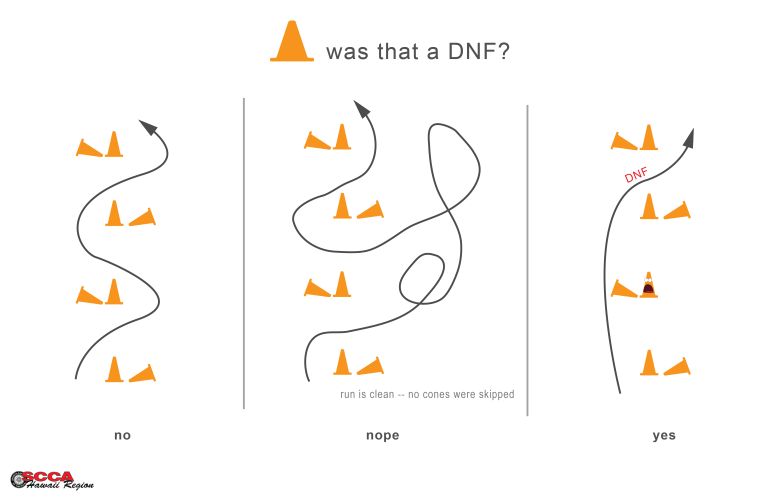 ​If the car goes outside of a gate, on the wrong side of a pointer (lay-down) cone, or completes gates out of sequence, then that car is OFF COURSE and is DNF’d. If a car spins around, turns around, or gets outside of the “normal driving line”, yet stays inside the proper gates, does not shortcut a gate and does not go twice through a gate, it is OK (no penalty). Only when a gate is missed is the car OFF COURSE. ​Don't forget to have fun!